Try a fully functional demo for 21 days for free. If you decide to buy a license after the trial period is done, you keep all the data you have saved in the demo. You have various ways of printing your data in WinFamily. One of them is as trees. You can vary the appearance of trees to suit your own personal preferences as well as being able to vary the amount of information included on each person. You can choose which direction you want your tree to be in. That is, will the first or last generation be at the top or will the first or last generation be to left or the right. Changing the direction can often help the information better fit the printed page. You can of course also modify your page layout from Portrait to Landscape to better fit your information. 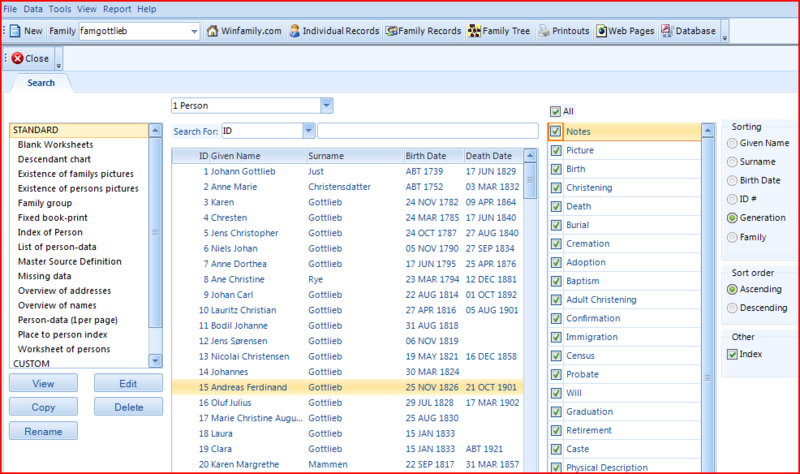 Download the demoversion of WinFamily and get started right away with registering your family-data. There are no limitations in the demo version compared to the fully licensed version. If you decide against WinFamily and want to try another program, you can export your registered data via GEDCOM and transfer them to any other genealogy-program that accepts GEDCOM. These features making it a «no risk whatsoever» to fully test WinFamily. 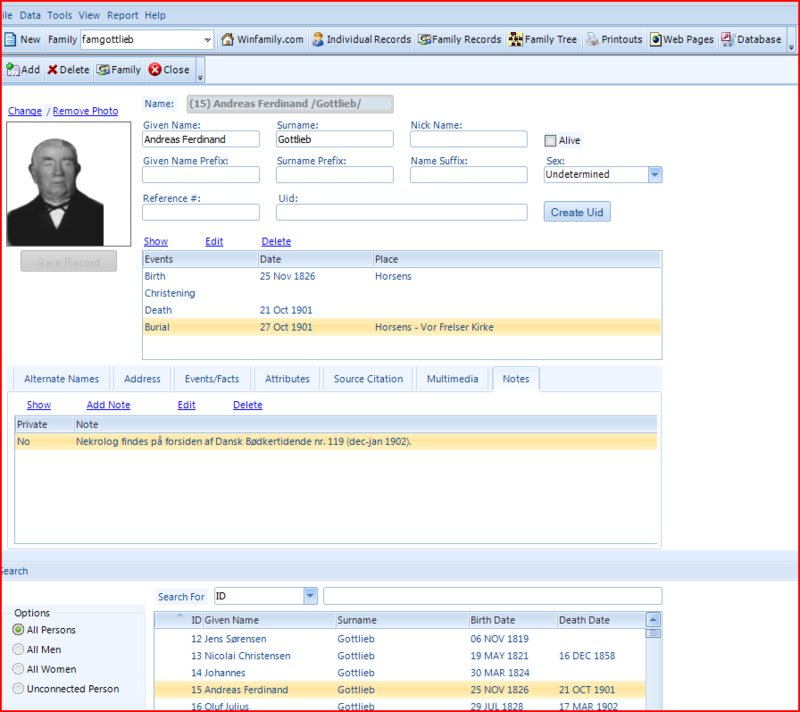 You can easily create your own fully-indexed, linked webpages for presentation of your genealogy-data. You can select the people you want to include on your webpages. From selecting one ancestor or decendants-line to presenting your whole database. You can also select how much information you want to include for each person. Including pictures from your database is also done by a mouseclick. Note particularly the possibility to limit data for living persons. For reasons of privacy people included in your database who are still living may not want their personal details published. If you have ticked the alive box when entering their data originally you can ensure their privacy is respected. You have the possibility to set backgrounds, text colors, fonts and so on. This means you get your webpages created exactly the way you want them. 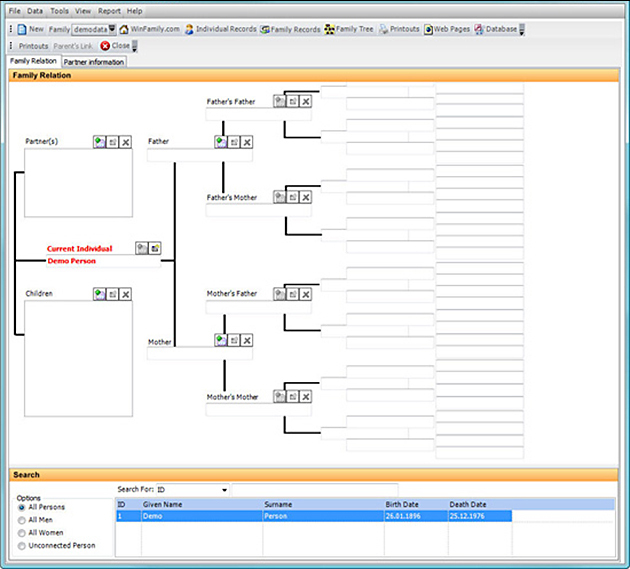 The user-interface in WinFamily is very intuitive and you will have no problems figuring out how to enter you data into the program. There is also a comprehensive userguide for you to download as a pdf for onscreen-viewing or to print.